In the early months of 2015, Skyburst were approached by Nerd TV to recreate a Thai Rocket which had gone viral on Facebook and Youtube, for Channel 4’s new TV show ‘Experimental’. Skyburst were given 2 months to recreate the rocket, and had only this video to figure out how to do it. 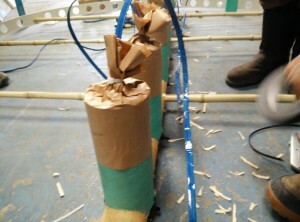 After many views of the above video, Skyburst decided that Bamboo would be the strongest and lightest material to create the structure with, the next challenge was how it actually fired. At first, we thought the wheel was spun with a motorised device, but after further inspection of the video, we realised it had dedicated motors to spin the wheel first. Traditionally, the black powder (gun powder) is pressed into the bamboo sections with a choke section causing the up thrust across the entire main beam. Due to health and safety reasons, and the absolutely devastating results this can cause, we had specific motors created which we would attach to the frame. See what happens when the 20ft Thai Girandola’s go wrong! We knew only 1 person who was perfect to get this project off the ground. We contacted Peter Stone, from Dean Fireworks, to see what his opinion was and if he thought he could create motors with enough thrust to lift structure into the sky. Peter was excited to take the challenge on, and instantly started created bespoke drivers and testing the maximum thrust created. But, we needed to know what it weighed before we could decide on the final size of thrusters. 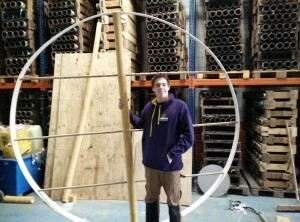 Due to safety reasons and unpredictability, Skyburst advised Nerd TV they would be prepared to build an 8ft Girandola, not the 20ft wheel shown in the original video. With the final diameter decided, we could now order in multiple sizes and lengths of bamboo to understand what was best to use. See how we constructed it with the timelapse video. 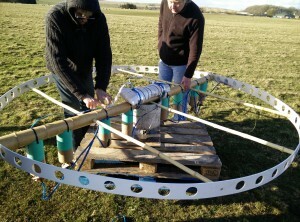 N ow that we had built the main frame we are confident will work, weighing in at 11 Kilograms. We needed to understand the amount of thrust generated by the motors Peter Stone had created for us. He found a 8 x 100mm diameter motor with a 15mm choke, would generate enough thrust to lift the frame into the air. 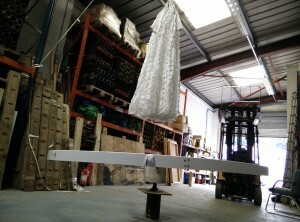 Before we tested the full size 8ft frame, Peter made a prototype which was only 4ft with half scale motors to give us an idea of how the finished product will perform. Which you can see, worked perfectly in the next video! So, we decided it was time to bite the bullet and test with the full size motors and frame. Due to the wind conditions, we had a successful launch, which quickly flipped in the wind, and plummeted straight at the floor. See video below for the first test results. With the second test blowing itself to pieces, we had run out of time for any additional tests before the big day when all the film crew arrived. So, to be on the safe side, we made an identical frame, and asked Peter to keep with the 15mm choke as this gave us a successful launch. With the film crew wanting to do 2 launches in total, we had our fingers crossed that the parachute would open, and return the frame to the earth in 1 piece, able to fly again on the following day. At this stage, the parachute was the only part we hadn’t got to successfully work. S o, the time had come! Production team were on site, and we had to show what we had been up to! Once we got to our dedicated firing site on the Mendips, Producer Steve turned to Luke and said ‘So, are we looking at a successful flight today?’. Which Luke replied ‘Its completely 50/50 at the moment, we’ve had 2 tests, 1 flew, the other.. well.. Exploded.. Spectacularly!’. Which all makes for good TV, right? Film crews all in position, Skyburst attached the parachute, and fused all the drivers to ignite at appropriate times. Praying we would have our first fully successful flight, with operational parachute.. It was apparent, the only thing on site that was flying high at this point, was everybody’s nerves! There was no going back, electrical firing system was booted up ready to go, everyone were in their positions ready to go… See for yourselves what happened next! YES! It worked! At the point the parachute opened perfectly and it started gently returning to earth.. All Skyburst Crew Erupted with cheers of joy, which was promptly stopped with lots of ‘Shhhhh’ing’ from the production team, as we were interrupting all their microphones! With all teams onsite over the moon with the result, we all went for a celebratory beer and well deserved dinner after a long day, resting up ready for launch #2! Peter Stone – Dean Fireworks, for creating and testing all pyro involved. Tom Gouder + Evie Eldridge – Parachute Construction and Repairs. All the team at Nerd TV for giving us such a fantastic opportunity!